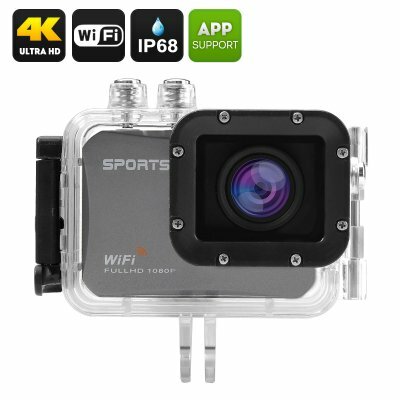 Successfully Added Ultra HD Sport Action Camera - 4K At 25FPS, 130 Degree View, 16MP, 2 Inch Screen, Wi-Fi, Free iOS + Android Apps, Waterproof 60M to your Shopping Cart. Make important moments matter and share them with the world in 4K. With the ultra HD action camera, you will have all the adventures at your fingertips. This compact Ultra HD cam will not only let you capture amazing footage in 4K, but also effortlessly share it with the world. Coming with 3200x1800 video resolution at 25 frames per second, it will ensure the best presentation for even your fastest adventures. With a 130 degree angle, you will have clear detailed videos while the 1/4 Inch 16MP SONY CMOS sensor will make sure your pictures look bright and crisp. The 4K action camera supports Wi-Fi network and thus lets you easily share the pics and videos right after you take them. Just send them to your smartphone and you can post on social media or email to friends and family. Before you do that, you can also review the footage on the 2 inch TFT LCD screen. The Wi-Fi action camera comes with free applications for iOS and Android platforms, giving you access to more features and easy controls. Coming with a 60m waterproof case and a set of mounts, adapters and clips, the sports cam is ready to follow you on your next adventure, right out of the box. The Ultra HD Action Camera comes with a 12 months warranty, brought to you by the leader in electronic devices as well as wholesale 4K action cameras..